In the occult classic The Mirror of Magic, renowned Surrealist Kurt Seligmann (1900-1962) draws from his encyclopedic practitioner’s knowledge and extensive antiquarian collection to offer a comprehensive, illustrated history of magic and the occult from Mesopotamia and ancient Egypt through the 18th century. He explores the gods and divinatory arts of the legendary Sumerians and the star-wise Babylonians, including the birth of astrology. He examines the afterlife beliefs of the ancient Egyptians and the dream interpretation practices and oracles of ancient Greece, including the mysteries of Eleusis and the magical philosophy of Plato, Socrates, and other Greeks. He uncovers the origins of Gnosticism and the suppression and banishment of magic by the post-pagan, Christian emperors of Rome. Seligmann reviews the principles of alchemy, sharing famous transmutations and allegorical illustrations of the alchemical process and explores the Hermetica and its remarkable adepts. Investigating the Middle Ages, the author discusses the work of European magicians of the time, including Albertus Magnus, Roger Bacon, Agrippa, Nostradamus, and Pico Della Mirandola. He studies the medieval practices of devil worship, witchcraft, and black magic, as well as the “Cabala” in both its Hebrew and Christian forms. He also examines the art of the Tarot and many lesser known divination techniques. He explores the development of secret societies, including Freemasonry and Rosicrucianism, in the 17th century and the increase in occult publications and magical science in the 18th century. 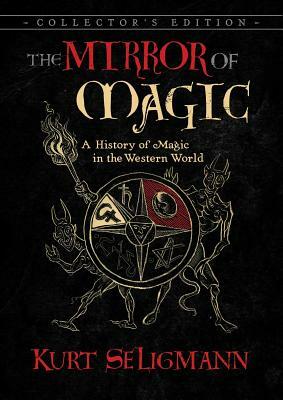 First published in 1948, this history of magic and the occult seeks to “mirror” the magical worldview throughout the ages. Beautifully illustrated with images from the author’s rare library, this collector’s edition features all of the artwork--more than 250 images--from the original 1948 edition. Kurt Seligmann (1900-1962) was a Swiss-American Surrealist painter and expert on magic, known for his extensive collection of rare books and his monumental role in the popularization of Surrealism in the United States. After the outbreak of World War II in 1939, he was the first European Surrealist to arrive in New York. After the war his work was exhibited widely and acquired by museums throughout the United States and Europe. He taught for many years at various colleges in New York City. "As well as being a feast for the eyes, the book is a delight to read." "Beautifully illustrated with images from the author's rare library, this collector's edition features all of the artwork--more than 250 images--from the original 1948 edition." "The Mirror of Magic is the book our scholar-practitioners of magic need to read. It’s like “The Encyclopedia of the Roots of Practically Everything,” preceded in this collector’s edition by a note from the publisher that Inner Traditions decided to preserve the book’s layout, typography “and most important, all 250 of Seligman’s illustrations from his rare and private collection” (p. iv). Read this marvelous book for yourself. Learn about historical magic and magicians. Study, for example, the forty-two illustrations in the section on alchemy and you’ll learn to recognize all the common alchemical symbols. And there’s a tiny bonus, too--the book comes with a red ribbon bookmark."